When I wrote I was all geeked up, I meant it. I even bought the t-shirt. I didn't realize this pic was taken. At least my chronic non-photogenicism can't do too much damage here. "But seriously, when it comes to semantics, we can get pretty muddled up in meaning. If you lose the context surrounding something (a word, a symbol an icon), you lose the meaning altogether." I had this exact experience last week. I was talking to Enric the videoblogger (as opposed to Eric the viking) about the meaning of life. Trivial stuff. I argued that there was none - there was no meaning to life. He argued there was. We kept going trying to figure out this problem for a while (it is that kind of a problem, as you might appreciate). We were trying to find common ground and not really succeeding, when it occurred to me that the meaning of the word 'meaning' might not mean the same to us both, if you see what I mean. I meant 'mean' as in 'does it have purpose' - does the sun have purpose? No, I argued - it is just 'there', in the same way that we are 'just here'. Enric then explained that he meant 'mean' as in 'does it mean anything to you'. Aaahh, we both said. Two quite different meanings of the word mean, depending on context. The phrase 'it is all about context' is one I use a lot, I like it. It invites us to understand that something's nature or answer to a question may change depending on external and varying factors. I also use 'it is all relative' a bit too, it has a similar effect, depending on the circumstances. Data must have context to have meaning - a data point needs to relate to another in order to be information. It can't just 'float out there' and be useful - as my grandmother once told me a data point it is just a data point without at least one more data point. (I made up the bit about my grandmother). Words need context to have meaning (as we saw, the word 'meaning' needs context to have meaning). "trying to scale semantic meaning muddies and destroys everything that is beautiful about social networks." Wow. That's deep. But I don't get it. There was not enough context for this sentence to have meaning (to me at least). So, I have to ask Tara, what, exactly, do you mean by this? 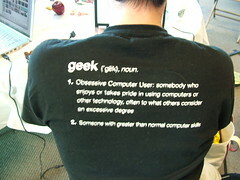 personnaly i wouldn’t say that being a geek is computer related. Geek speak is a language and a level that you and I connect on. Then person C comes by and wants to connect with us, but doesn’t speak geek. What do we do? We change our language to be inclusive. That’s all nice and good. But then the circle gets bigger and bigger and all of these people join in the conversation. Then you and I look at one another with panic because all of a sudden, the conversation has turned into some chatter about how blogs are just a fad. We have all of a sudden become excluded from our own conversation.